Stabilization | Friends of Fort Caswell Rifle Range, Inc. They asked each other: Should this piece of history be saved? The most recent progress is found at the top. To read the story from start to finish, begin at the bottom. Please visit our blog often! 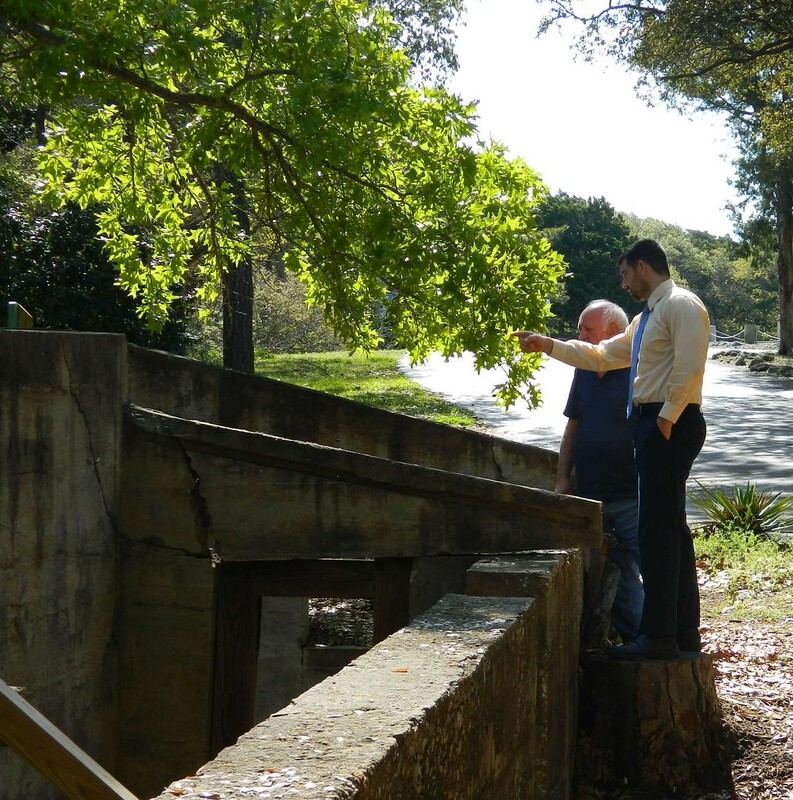 The engineer that the NC State Historic Preservation Office recommended visited today along with an expert on hydraulic jacks to advise the Friends of Fort Caswell Rifle Range on additional stabilization work. Both agreed that the age of the walls and the lack of rebar, which adds stability and strength to walls, may cause more cracks without proper caution. It seemed likely to them that typical foundation repair and jacking to hold the wall straight would cause the wall to crack. It may not be possible to completely straighten the walls. If so, then additional shoring can be added and repositioned to make it safe and add headroom to enable walking through the passageway. 6″ X 6″ strips would be placed across the walkway floor and painted orange to alert a walker. An estimate on price will be provided soon. Any proposed work will be submitted to the State Historic Preservation Office for approval. 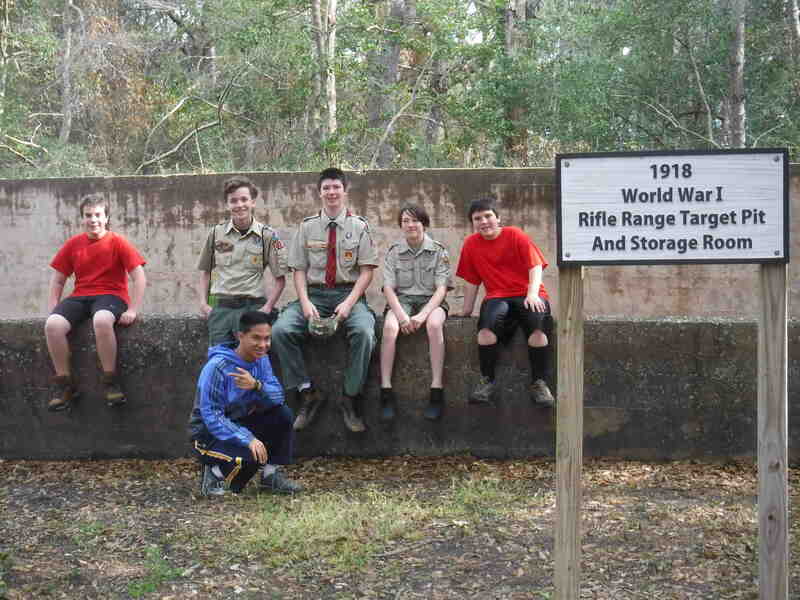 Eagle Scout Candidate Ethan Pannkuk and fellow Scouts from Troop 210 in Carolina Beach spent two days at the 1918 Fort Caswell Rifle Range to complete the work Ethan had planned for his Eagle Scout Service Project. After two days of grueling work, the floor and drainage ditch of the target pit was completely clear. The other side of the north wall had been exposed to the base, to verify the integrity of the footers. On Tuesday, April 3, the State Historical Preservation Office returns to inspect the work and guide the Friends of Fort Caswell on the next steps. Read the posts for more details and pictures. 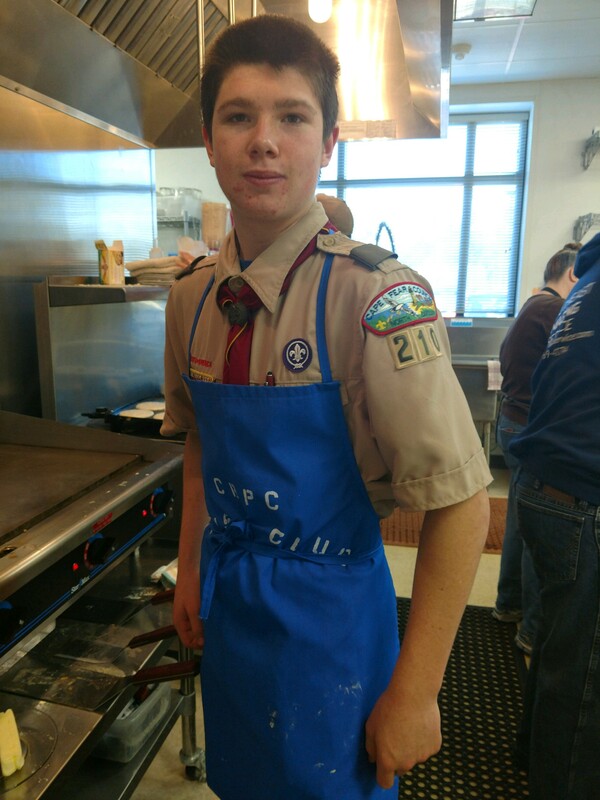 We thank Eagle Scout candidate Ethan Pannkuk and Troop 210 for their hard work! After several months of research, planning, and obtaining approval, Eagle Scout Candidate Ethan Pannkuk has scheduled the work on the bunker for the end of March. Read the announcement linked to the date of this entry. Pictures and a story will follow in April! As Friends of Fort Caswell Rifle Range considered other avenues for stabilization, a wonderful proposal came our way. Ethan Pannkuk, an Eagle Scout Candidate from Troop 210 in Carolina Beach suggested his Eagle Scout Project as a means to assist with additional stabilization. Caswell Dunes Homeowner Association manager Gary McDaniel contacted Ram Jack, a business from Wilmington, NC, that specializes in hydraulic jacks that are most successful at repairing walls such as the rifle range. Landon Llewelyn met with Gary and took videos of the rifle range to show engineers at Ram Jack. We are waiting for possible answers from their engineers as well as the Friends engineers, Brian Ross, PE, and Paul Shivers, PE. We also would need approval of the repairs from the NC State Historic Preservation Office since the rifle range is on the National Register of Historic Places. A local construction company shored up the passageway wall to prevent the wall from collapsing. We were advised to do this before excavating behind the north passageway wall. After the shoring was complete we had Wilson Balcom, another local contractor, excavate behind the north wall. We continue to search for foundations that might look favorably on awarding a grant to the Friends of Fort Caswell Rifle Range. So far we have not been successful. In the meantime, we will continue to have our yearly Kentucky Derby Fundraiser and keep the historical site in the news. Brian Ross, PE, (of Ross Linden Engineers) sent a completed copy of the Engineering Study with a list of suggestions for stabilizing the rifle range along with impeccably precise directions for repairing the walls and lintels. Brian advised us to first focus on the passageway wall that is tilted inward six inches. Dale Clemens, owner of Carolina Tree and Landscape Service, arrived at 9:30 am with three crews to remove 17 trees that were identified as damaging the rifle range. Neighbors enjoyed watching them climb and cut branches one at a time in order to avoid damaging any of the walls on the rifle range. The crew completed work at 7:30 pm, clearing all traces of their work. After almost 100 years there is bound to be tree damage. Remember there were no trees in the area of the rifle range when it was being built. In fact Fort Caswell covered the entire area from the mouth of the Cape Fear up to the current Yaupon and Long Beach. A tree caused a vertical crack within the rifle range. The lintel with a large crack. A picture from inside the target area looking at the temporary supports put in place by Joe and Victor, Caswell Dunes employees. Brian Ross, PE, (of Ross Linden Engineers) gathered information to prepare an evaluation and study of the rifle range. Project Engineer Paul Shivers, PE, and Jim McKee, manager of Brunswick Town/Fort Anderson, also attended. You can see several of the trees against the north wall, the wall on the left, threatening the integrity of the structure. The Order of the Alligator Award was presented to Norma and Ron Eckard for outstanding volunteer service to the town of Caswell Beach in their efforts to stabilize and preserve the Fort Caswell Rifle Pit. This award was presented by Mayor Pro Tem Deborah Ahlers to the Eckards at the annual holiday reception. Trees are putting pressure on the north wall. Another view of trees on the north wall. Notice the crack caused by the pressure on the wall. Also notice that timbers and hardware donated by Lowes Home Improvement have been installed as temporary supports for the failing lintel over the doorway. Another failing lintel between the passage/walkway and the target area. Notice that timbers and hardware donated by Lowes Home Improvement have also been installed here as temporary supports for the failing lintel over the doorway. 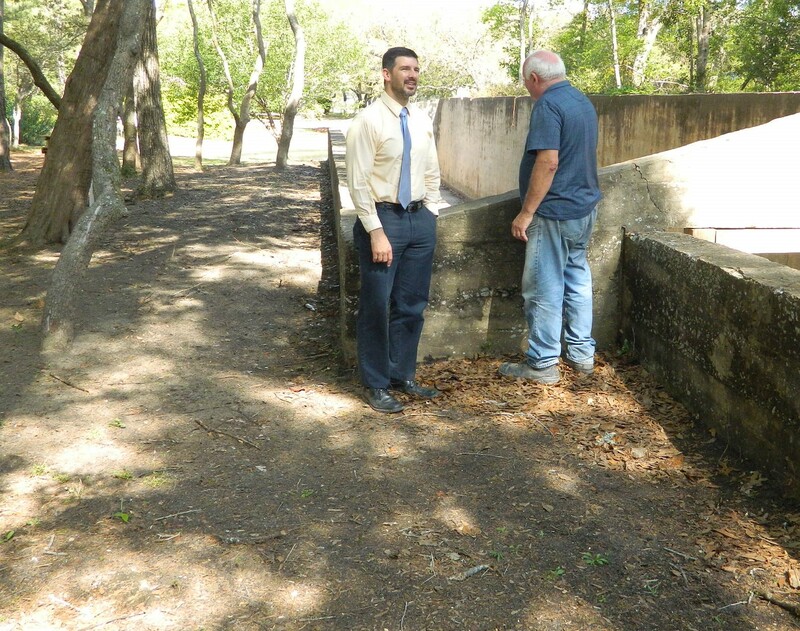 Word was received by MDM Historical Consultants that the Fort Caswell Historic District and the dis-contiguous Rifle Range Target Pit have been added to the National Register of Historic Places. Formal notice will follow. The Caswell Dunes Special Interest Committee and the Caswell Dunes HOA receive word from the State Historical Preservation office in Raleigh that the application has been approved and will be sent to the National Park Service for their approval. The second fundraiser is held at the Caswell Dunes Clubhouse. The Kentucky Derby party featured table horse races and two stained glass pieces that were sold by silent auction. Thanks to Marti Hardy for her donated stained glass pieces. Many people dressed in their Kentucky Derby finery which added to the mood of the Kentucky Derby party. Advertising at the Caswell Dunes Clubhouse. The walkway between the storage room and the target area has been completely cleared. Mason’s Mark on north wall. Severe cracks in the lintel between the storage room and the walkway. End to end picture taken from inside the west wall of the target area. Severe cracks in the lintel between the walkway and the target area. Target area showing recovered portions of the target assemblies. Entire length of structure taken from the south side. MDM visits Caswell Dunes and agrees to add the Rifle Range Target Pit but they must start work immediately and payment must be made before the work can begin. The recently established Caswell Dunes Special Interest Group arranges for a loan from its members and makes the payment to MDM. Word is received from the State Historical Preservation Office in Raleigh that the Rifle Range Target Pit qualifies as a dis-contiguous extension of Fort Caswell. This will allow the Rifle Range Target Pit to be added to the Fort Caswell application for listing on the National Register of Historic Places. In order to do this we needed to get agreement from Jennifer Martin Mitchell of MDM Historical Consultants, the group preparing the application for Fort Caswell. The storage room floor on the east end of the structure has been completely cleared. Lee Hinnant of the State Port Pilot http://stateportpilot.com/ visits the Rifle Range Target Pit and later writes a story for the newspaper which tells of the efforts of the Caswell Dunes residents. The first Rifle Range Target Pit fundraiser, a pig roast, was held. Bo and Sydney Grove show the newly built sign that they donated for display at the front of the Caswell Dunes structure. Jim McKee brought people from the State Historical Preservation Office along with several engineers and history buffs to inspect the structure. Work to remove the dirt and roots from the floor continued. After Caswell Dunes employees cleared vines and bushes from the periphery of the structure the first work removing debris from the floor of the structure began. Jim McKee, Historical Interpreter at the Brunswick Town and Fort Anderson center made his first visit at the suggestion of members of the Caswell Dunes Landscape/Grounds Committee. The Rifle Range Target Pit began as an overgrown structure. These photos were taken during the first workday organized by the Landscape/Grounds Committee of Caswell Dunes. The interest in the Rifle Range Target Pit started at this time as an offshoot of the landscape/grounds improvement work.